I’m at a slight disadvantage writing this article on a Monday for publication on a Thursday. Now I’m no Mystic Meg but I can hazard a guess that – short of the Prime Minister pulling her ‘Meaningful Vote’ for a second time (which isn’t beyond a possibility) – this week is probably going to be one of the most important in recent Parliamentary history. Now at this moment in time, the good money is on Theresa May’s EU Withdrawal Agreement being voted down, and by a heavy margin. This might turn out to be a damp squib event and her Christmas ‘pause’ and charm offensive might have paid off. If that’s the case, then apologies for the rest of my thoughts. We are then leaving the EU on 29 March with the Withdrawal Agreement in place. End of article. But if, as expected, we end up seeing the Government defeated by a substantial margin, what next? Let me firstly reiterate my position. I campaigned for and voted Remain in the 2016 EU Referendum. But I’m a democrat. Bluntly, if you’re not prepared to accept an answer contrary to the one you supported, then you don’t put the question. Almost 62% of Tamesiders and 61% of the electorate of the Denton and Reddish constituency (which includes Audenshaw, Dukinfield and a part of north Stockport) voted to leave. I accept and respect that vote. That’s why I voted for the triggering of Article 50, which is the process by which we leave the EU. That the Government has made a monumental mess of negotiations in the ensuing two years is of little comfort. Actually, worse, has been the Prime Minister acting as though she had a huge overall majority in the Commons even after she had lost her majority in the 2017 snap General Election (that ironically she called to give her a bigger mandate on the issue of Brexit). She could have, and should have, reached out across Parliament to secure a sensible cross-party Brexit policy and avoided the bitter divisions we now see. And that’s the final point I want to make now. Britain today is deeply divided. More-so than in the immediate aftermath of the referendum that saw half the population (and two of the four home nations) vote in different columns. 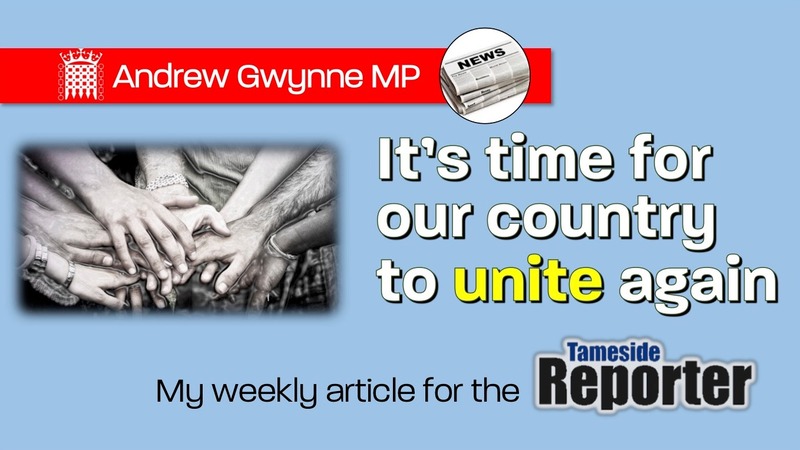 Wherever we land after this week’s vote, and however the Brexit policy evolves before we leave in March, we need to look at how we bring society back together again. And for me, where we start is by tackling some of the underlying reasons many people voted to leave: that too many people in too many communities feel politics is something that’s done TO them and not WITH them; that no one’s listening to valid concerns; that whole areas feel ‘left behind’. Only a truly radical and transformational programme to rebuild our public services, our industry and our communities will change that perception; not more of the same, but a Government working in the interests of the many and not the few.